This BLOG is about me a man with a strong passion for perms. I know there are more men like me, men that get sexually exited over having a perm done, or seeing it done. It all started when I was a child, I can vividly remember that in late 70’s / early 80’s salons for woman looked much more appealing to me. So many nice colors in the salon, and those capes with those nice patterns, rows of dryers and many woman in rollers or permrods, oh boy did I wanteed to know how that feels. But what then? Have real curls on me? Won’t I look “silly” , wont people think about me differently? 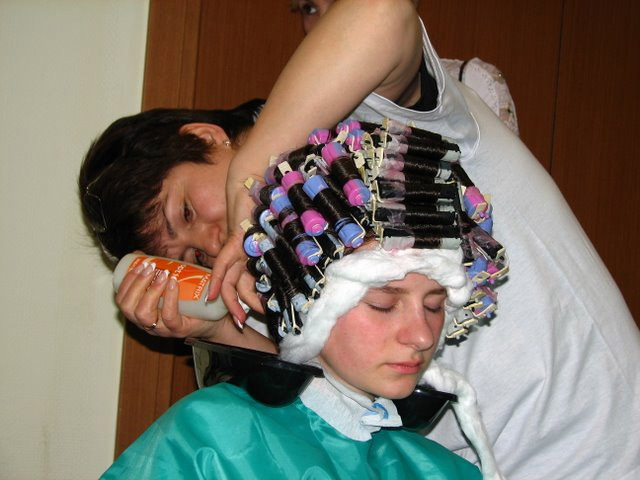 During my teenage years and puberty I started to do somekind of home-salon-play, using hairrollers we had at home. Later I even bought permrods and a saloncape. This playing around was a lot of fun to me , but ofcoarse not real. The dream of being permed for real wasn’t fullfilled untill 2006. I loved that time in the salonchair so much and curls on me seem to “work”, since then I haven’t looked back, I still get my hair permed and I still love it all. Over the years I have met with many nice people online that share similiar feelings as I have. I am glad that I used this blog to show the world that if you want something you have to go for it, I hope this encourages others to do the same. If you want to help, have an idea or… then please contact me per Email on my Emailadres: j_wagemakers@yahoo.com ( no messenger ! ) , ask me for details for how to chat , webcam is mandatory to be able to chat with me. Roll Up! Roll Up! Roll Up!